PEU Report: Warrior Connected to War on Cash? Overnight, Modi’s government de facto outlawed an estimated 86 percent of all cash in circulation by value. People had 50 days to hand in the notes or they become worthless. Yet the government, despite stating it would issue new, more secure 500Rs and 1000Rs bills, had nowhere near the equivalent value of new notes ready for replacement. They say it may take up to a year to print enough, which means confiscation, de facto. Faked opinion polls with slanted questions done only via smart phone apps of which only 17% of the population has access, claimed that “90% of Indians approve” the demonetization. Yet it’s far worse. India is an underdeveloped country, the largest in the world in population terms with more than 1.3 billion people. By demanding Indians turn in all 500Rs and 1,000Rs bills to banks, Modi is forcing major change in how Indians control their money in a country high on the corruption scale where few trust government let alone private banks, and prefer to deal strictly in cash or hoard gold for value. Nearly half the population, some 600 million Indians, do not hold a bank account and half of those, some 300 million Indians, lack a government identification, necessary to open an account. When he presented his shock announcement, Modi pitched it in terms of going after India’s black economy. Soon he shifted gears and was praising the benefits of a “cash-less society” to enable Indians to enter the digital age, appealing to younger Indians, savvy in smart phones and digital networks, to convince the older of the benefits of online banking and consuming. The drastic demonetization declaration was planned by Modi and five other inner-circle ministers in complete secrecy. The Modi cash-less India operation is a project of the US National Security Council, US State Department and Office of the President administered through its US Agency for International Development (USAID). Astonishingly, the report, prepared for USAID by something called the Global Innovation Exchange, admitted that “97% of retail transactions in India are conducted in cash or check; Few consumers use digital payments. Only 11% used debit cards for payments last year. Only 6% of Indian merchants accept digital payments…Only 29 percent of bank accounts in India have been used in the last three months.” The US and Indian governments knew very well what shock they were detonating in India. The Global Innovation Exchange includes such dubious member organizations as the Bill & Melinda Gates Foundation, a major donor to the Modi war on cash initiative of USAID. It also includes USAID itself, several UN agencies including UNICEF, UNDP, UNHCR. And it includes the US Department of Commerce and a spooky Maclean, Virginia military contractor called MITRE Corporation whose chairman is former CIA Director, James Rodney Schlesinger, a close associate of Henry Kissinger. Senior Partner for Global Technology Partners, a defense oriented investment firm. 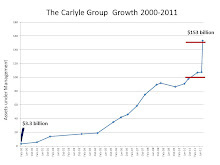 He is also a member of the Board of Trustees of the MITRE Corporation. "The addition of Dr. Carter will strengthen our efforts to help Americans at all income levels transition to the economy of the future." Does cashless fit into Markle's future? 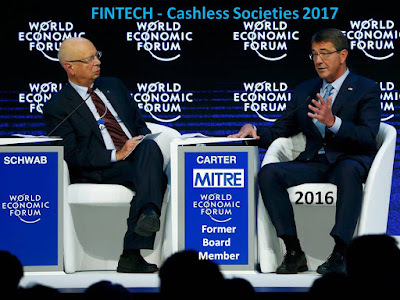 Cashless societies were the topic du jour at the recent World Economic Forum in Davos. 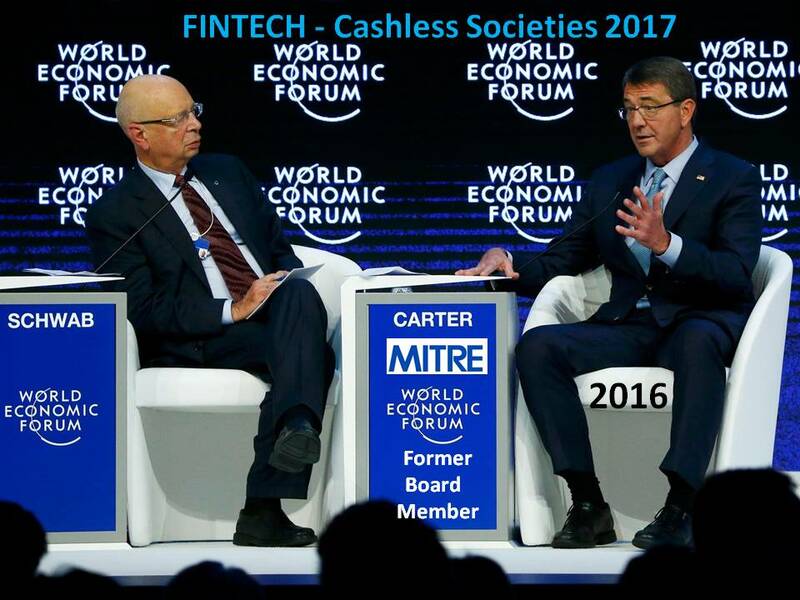 Carter spoke at the 2016 WEF meeting stressing the need for technology and partnerships to keep America and the globe secure. Update 1-28-17: Europe proposed restrictions on use of cash.